or "Survival of the Fittest"
Not many parts are avaible for older cars these days, and you are lucky if you can find decent '79 Cougar parts cars. 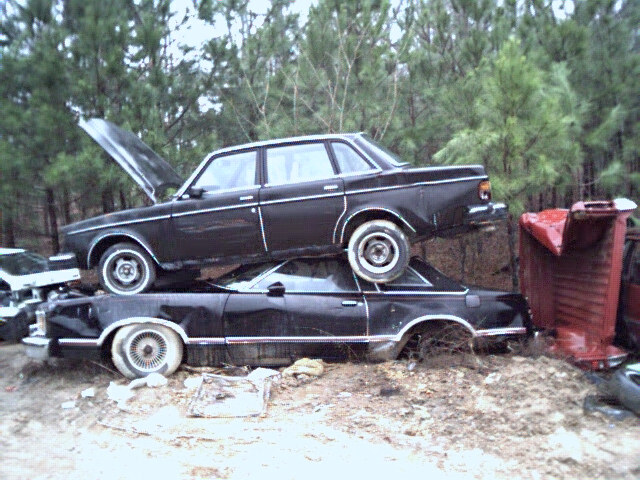 Well, as luck might have it I have found a few cars with lots of scavenging potential. I actually decided to name these cars, like in "Gone in 60 Seconds." Pictures of Betty and Eleanor are coming soon. I'll have a list of parts I get from each car as I get the pictures and stuff. Jenny is a 1979 Mercury Cougar that seems to be mostly intact. It might be because of the Volvo that has been atop her for about 10 years. I think she has an engine and some of the dash components could be quite valuable. She's certainly a find. Betty is a 1978 Lincoln Continental that is mostly gutted. I doubt there is much more to get out of her. The vacuum canister I got from her is working alot better than the one I had. It was kind of dented and maybe a little too small to provide enough vacuum for the car. I cleaned it, primed it and painted it the color of the body of my car. It kind of didn't want to fit, because of the different mounting, but I made it, with the help of some wire ties. Eleanor is a 1978 Ford Thunderbird that has granted me may items. First is a bumper that is still, due to a lack of garage space, sitting in my driveway. I have also reaped a new clock, radio, and various interior components. I'll probably get the antenna someday.